The NWAC7000 is an access controller for managing, controlling and monitoring Wireless Access Points simultaneously in a same networking diagram. It supports PPPoE, Static IP, Dynamic IP and PPTP, with 5 10/100/1000Mbps RJ45 Port, with function of QoS, MAC filter and Tag VLAN. Manage and control: NWAC7000 can set AP?s SSID, Password, channel at the same time. Automatic upgrading firmware, restarting, resetting, adjustment of subscriber?s QTY, wireless coverage, transmit power, making the wireless signal more stable, improving wireless networking quality. Real Time Monitor and Analyze: NWAC7000 will monitor and analyze wireless AP all the time, then show AP?s working status on Web management page, making maintenance easier and simpler for the installer. 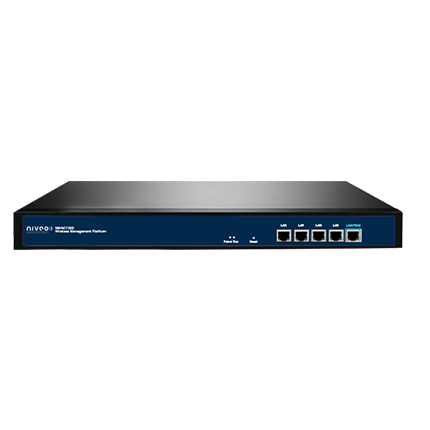 The NWA7000 supports Quality of Service based on bandwidth control, adopt bidirectional bandwidth control based on IP and MAC. It avoids BT, Thunder and other P2P applications to take excessive bandwidth, and minimizes low throughput, dropped packets, errors and latency.